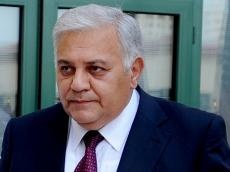 The delegation led by the chairman of the Azerbaijani Parliament Ogtay Asadov, will take part in the third meeting of the chairmen of the parliaments of the Eurasian countries, which will be held in Turkey’s Antalya on October 8-9, the Azerbaijani Parliament said in a message Oct. 6. The event will be attended by representatives of parliaments of more than 40 countries and a number of international organizations. The delegation includes the chairman of the parliamentary committee Ali Huseynli, deputies Khanlar Fatiyev, Agalar Veliyev, head of the parliament’s apparatus, Safa Mirzayev and other officials. Economic cooperation in Eurasia will be discussed during the meeting and Ogtay Asadov will make a speech on this topic. A number of meetings with the heads of other delegations participating in the event are also scheduled.